Left to right: Anita Clingerman, Fisher House Assistant Manager, Col. Richard Looney, Jacob Mansapit, Lucy Afileje, Joel Mansapit, Jr., Alysah Mansapit, Aubrey Mansapit, Theresa Johnson, Fisher House manager and Stanley W.O. Lum, Executive Director of Armed Services YMCA. Something was missing in my life this Valentine’s Day. No, not my husband, he was there by my side and we had a delightful, quiet evening at home with a lovely homemade dinner and a fabulous bottle of wine. What was missing was my annual Valentine’s Makeover stories. At The Honolulu Advertiser, I used to offer three makeovers to deserving women each Valentine’s Day. There was never any difficulty finding spas, hair and makeup people to help out. Honolulu is a giving city and the entire industry stood ready to help. I would receive dozens of nominations for makeover recipients and many would make me cry. I miss meeting those wonderful women and visiting them as they were primped and pampered for their Valentine’s dates. But fear not, Paul Brown Salons and Day Spas has taken over in the makeover department. Each month, Paul Brown will present Operation Makeover to one lucky military member of the Armed Forces family. It’s a gift to members of the Air Force, Army, Coast Guard, Marine Corps, National Guard and Navy and their dependents. 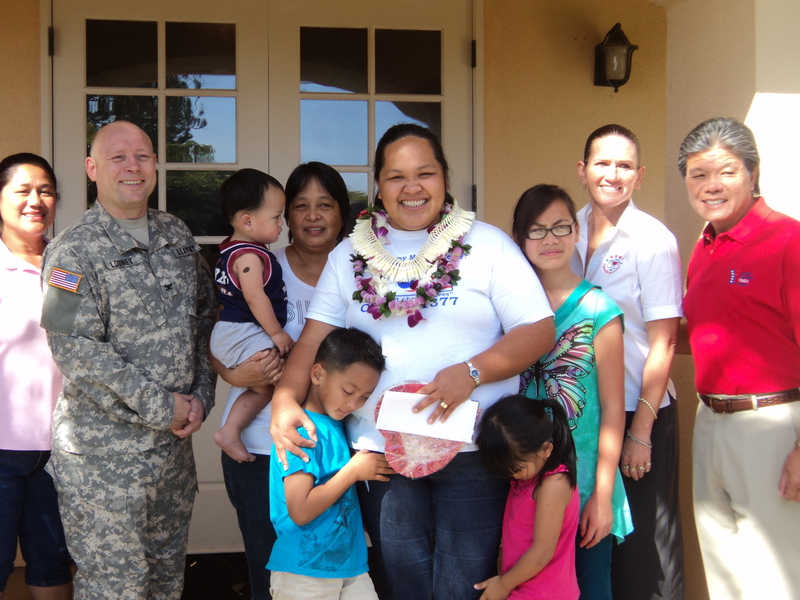 This month’s winner is Joni Mansapit, an Air Force spouse and mother of five. She has been awarded a complimentary weekend of luxury and pampering. She was recognized not only for providing support to her active duty husband and family but also for assisting others living at Tripler Fisher House, which provides housing to families and patients receiving treatment at Tripler Army Medical Center. Joni will receive a makeover from Paul Brown Salons & Spas, dinner for two at Roy’s Restaurant Waikiki, two nights’ ocean view accommodations at the Waikiki Beach Marriott Resort & Spa and a personally escorted $250 shopping excursion at GUESS. Joni was born and raised on Guam and has been living with her children at Tripler Fisher House for the past 22 months. Her fourth child, Abigail Joy, was diagnosed with Down syndrome and has experienced two life-threatning episodes that required her to be taken by medevac to Tripler Army Medical Center. Beyond her own challenges, Joni has dedicated herself to providing support to the seven other families currently at Tripler Fisher House. She helps them make appointments, takes them shopping, cooks dinner and generally does what it takes to raise her housemates’ spirits. For information or to nominate a member of the Armed Forces family, contact ASYMCA Project Coordinator Kehau Bice at (808) 473-3398 or download the nomination form at http://paulbrownhawaii.com/operation-makeover.asp. This entry was posted in Helping Hawaii Non-Profits and tagged Joni Mansapit, Paul Brown Salons & Day Spas. Bookmark the permalink.